They are joined by 500 parents and relatives and 16 teachers, all of whom have participated in this project funded by the Generalitat Valenciana. 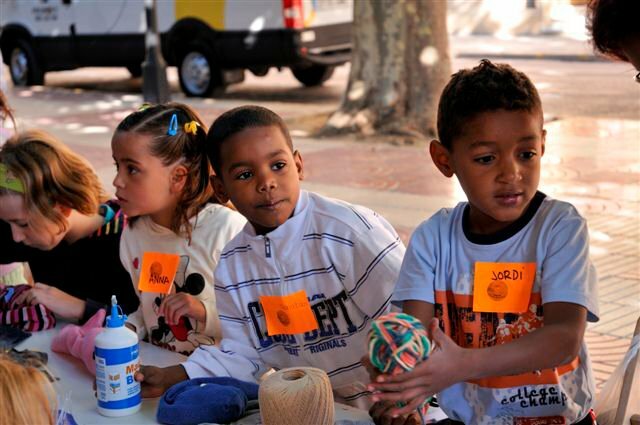 'Increased knowledge and awareness of the MDGs by creating puppets from recycled materials' is the title of the project that Humana Fundación Pueblo para Pueblo has been implementing since June 2010, with results even better than those expected. The project thus far has reached approximately 1,000 children aged 7 to 11 years, 500 parents or relatives, and 16 teachers. These individuals participated in the various awareness workshops that were held at nine different events at seven schools: Mislata, Santa Pola, Requena, Antella, Sollana and Albaida. The aim of the workshops has been to increase awareness about the MDGs among the children, their parents, and their teachers. Through dynamic and interactive activities, the project hopes that these goals and how they can be attained will be internalized by all participants. Through workshops and events, children have become aware of the MDGs in an entertaining and fun way: by making puppets with recycled materials. The project has also published and distributed a book of short stories that aims to familiarize children with the different cultures and lifestyles of children in other parts of the world. The book includes everything needed-texts, patterns for puppets, and instructions for making the puppets and how to make a puppet theater for a performance. You can download the storybook by clicking here. Humana thanks the Generalitat Valenciana and the schools and municipalities that collaborated in this initiative, which will run until February 14. Those responsible for the development of the project recently went to the Education Faculty at the University of Valencia to give a short talk, which addressed issues such as the project’s high turnout and originality. The project falls within the area of Education for Human Development, which focuses on three main issues: climate change, the Millennium Development Goals, and recycling. The actions carried out are aimed primarily at children aged 7 to 12, their families, and their teachers.